From Zero Knowledge - Kimono and Living Primer. For those who can read some Japanese and love to make things I cannot recommend this book enough for its sheer quality and quantity of ideas, suggestions and life-hacks for living in kimono. From ways of washing your tabi, to making haneri, to suggestions on the top kimono related accessories to keep in your bag: this book has you covered. It is heavily illustrated (EVERY SINGLE PAGE) in a lovely simple but engaging way. It has numerous step by step visual instructions illustrated. One of the major draws of this book or me, and it's sequel the Zero knowledge Kimono and Playing Primer(知識ゼロからの着物と遊ぼう入門), is that it is basically a series of two page mini-articles on aspects of kimono that range from the process of wearing, of buying, of making and of living in kimono. Scattered through these are snippets on things like Japanese makeup, the origins of kimono widths, how Japanese sitting posture has changed over time through the influence of their clothing, explorations of specific traditional motifs or non-functional kimono accessories and many other interesting things. 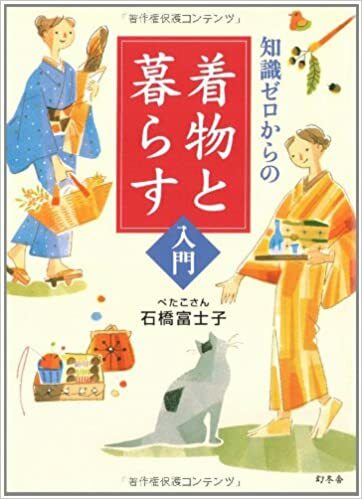 If you are learning Japanese this is also a nice bite-by-bite book to practice reading in that it has furigana on a lot of the kanji and has plenty of small but interesting sections so you don't exhaust yourself getting through it. And bonus - reading it will help you build up a kimono relevant vocabulary.